It's been a little while since I've specifically talked about how my training is going. For the most part, really well. Cycling is my strongest and the discipline I am most experienced with and I think I am making some small gains in speed. My focus on the bike has been really good for a few months so I think it's resulted in more power. I am in the last phase of my indoor cycling class and the current phase is all about speed. 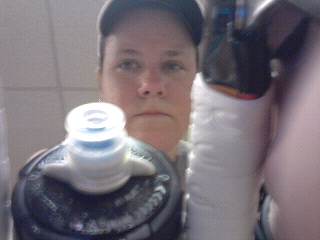 The pic today is from last night's class which featured 4 intervals that took me into 90+ max heart rate. So not a flattering photo but it does paint a picture. :-) Whew. Big gains are being made with my running thanks to Coach Mary giving me a push. I have a big test coming Sunday with the Publix Georgia Half Marathon. If I do the time that Mary has in mind it will be a PR and I think is definitely achievable. Cross your fingers for me! Swimming is swimming. I'm working at it and am getting faster but the faster I go the sloppier I get. My masters swim coach told me a few weeks ago that we didn't invite tired and sloppy to the pool. I am constantly having to rescind the invitation. You are correct, Coach Will does love it!!! Susan worked very hard last night. It's not about the pain, it's about the suffering and everyone suffered last night.